A key part of Facebook's ambitious plan to deliver Internet connectivity via drone is an air-to-ground laser link that will connect the high-flying aircraft to the Internet, and on Tuesday, Facebook showed off important progress in that technology. 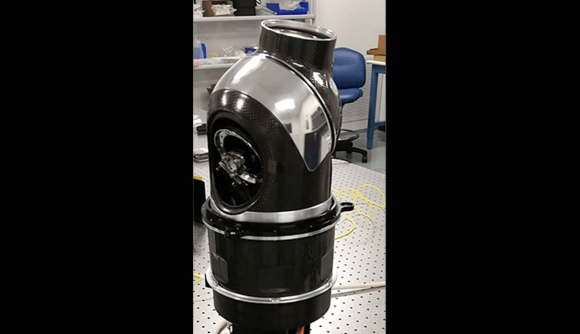 The company's Connectivity Lab has developed a gimbal that will hang from the underbelly of the Facebook drone and keep the laser system connected to a ground station. Getting a reliable, high-bandwidth connection to a drone at 80,000 feet is not a trivial task, as Facebook CEO Mark Zuckerberg outlined last month during a speech at Mobile World Congress in Barcelona. He likened it to shooting a laser pointer from California and managing to hit a coin on the Empire State Building in New York. "The goal is to get 10 to 100 times faster than traditional communications systems for beaming down access," he said. 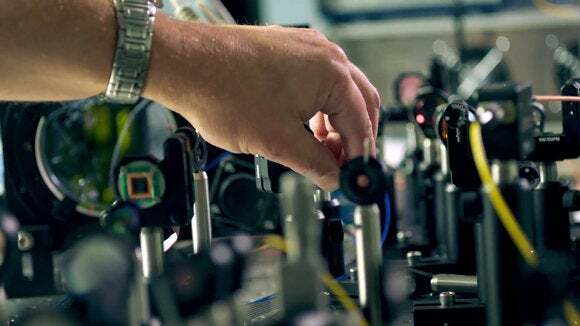 Facebook chose a laser over radio signals because it can realize higher bandwidth, but aiming is so critical. The new gimbal is made of carbon fiber and a magnesium composite, both lightweight materials that help keep the total weight at about 3.5 kilograms (7.7 pounds) -- a critical consideration for something that needs to stay aloft for months. The new device is at least two times lighter than the existing gimbal technology, and the company projects future versions will weigh less than 3kgs. The drones will use WiFi or LTE cellular to connect to users on the ground, but the entire system will be useless without a stable and high-bandwidth Internet connection, so that's why the gimbal is a key piece of the entire system. The drones are still under testing. Last month, Mark Zuckerberg said Facebook plans to begin test flights of its solar-powered Internet drone later this year.